Greater Western Sydney delighted coach Leon Cameron with an excellent 72-point win over Essendon to start the new AFL season. GWS won 16.16 (112) to 5.10 (40) in front of their biggest crowd for a non-derby game during the regular season. The 15,424 fans at Giants Stadium saw them build up a 31-point lead by the time Essendon managed their first goal at the 10-minute mark of the second quarter. 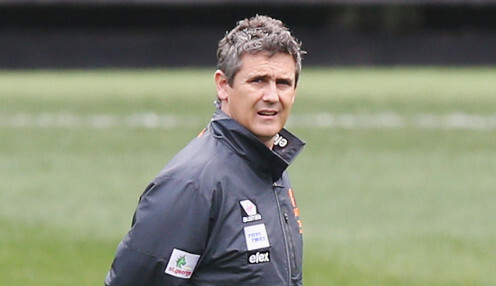 The Giants, who were without co-captain Callan Ward and gun midfielder Josh Kelly, had a further setback when defender Lachlan Keeffe suffered a knee injury just 16 minutes into the match. We know we've got a huge challenge (ahead) but I couldn't be more proud of our boys because they played a brand of footy our supporters would have been really proud of. But Keeffe, who was hurt when he hyperextended his left knee in a marking contest, returned in the second term and booted three majors in the match. Stephen Coniglio was outstanding for GWS, collecting 31 touches, seven clearances and three goals. He was well supported in midfield by Jacob Hopper (29 disposals) and Tim Taranto, who finished with 31 disposals, eight clearances and two goals. Cameron said: "I know there'll be headlines about round one, but I've been in this game long enough to know we've just taken off on a marathon; if it's a 22 km marathon we've just run 1km. "We know we've got a huge challenge (ahead) but I couldn't be more proud of our boys because they played a brand of footy our supporters would have been really proud of." Essendon trailed by 33 points at the main break, having kicked just two goals in the first half, and their coach John Worsfold admitted his players had looked "shellshocked" at times. "You don't expect to step out like that in round one and be so far off the mark against the opposition, so we were very disappointed by that," he said. "We played very poorly, well below the level we would like to be playing at." Greater Western Sydney are 15/2 to win the Grand Final. The Giants are 7/4 to win their next game against West Coast, who are 12/25.